Musical adventures of John and Mary are a series of musical fairy tales that gently acquaint children with simple musical concepts in an accessible and entertaining way. In the Land of Note-Gnomes – with which children learn how to read and write musical notation. With attractive illustrations and funny characters that accompany John and Mary on their engaging journey through the Music Wonderland, the books of this series will awaken and develop children’s interest in music. the Secretary bird Ms. Scribble. 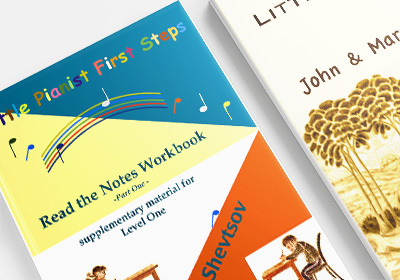 The books are suitable for children from 6 to 11 years of age, and would be a good complement to every child’s musical education. The author, Victor Shevtsov is a professional piano instructor with a doctorate in Music Education and considerable success with helping students achieve high levels of musical accomplishment, as well as a self-published author of musical education texts. Illustrations are by Maria Damgaard, a successful artist with a diploma from the Ecole des Beaux-Arts in Paris. Help your Child Excel at the Piano / Getting Started: When should music education begin? Another question that often plagues parents is when to start teaching their children music? To answer this question, we first need to distinguish between three types of children’s music education: home activities, which introduce children to music in informal ways; group music classes, which teach children basic music concepts and help develop all-around musical abilities; and private lessons, which focus on learning to play a specific instrument, e.g., the piano. Each of these categories emphasizes a different aspect of music education, and is equally valuable, depending on the age of the child. In this chapter, I discuss the merits of an early start to music education, and various activities and programs for children of different ages. So what is the best age to begin music education? In my view, there is no time like the present—it’s never too early to introduce a child to music. A popular story amongst educators tells the tale of young mother, who asked a famous teacher at what age she should start educating her son. “How old is your son?” asked the teacher. “He is only six months old,” said the woman. “You are already six months late!” was the teacher’s reply. Help Your Child Excel at the Piano / Talented or Gifted? We have all read about young performers who are described as “musically gifted.” What does this mean? And how do you discriminate between a young musician who is merely talented and someone who is musically gifted? • A musical memory: The ability to recognize and accurately reproduce musical material. The musically talented child typically displays a high aptitude for one (or more) of these skills, and easily develops the remaining abilities with the help of music lessons. A gifted child, on the other hand, demonstrates a heightened level of all of these essential four musical abilities from the start, beginning with an excellent sense of rhythm, highly creative and imaginative thinking, and a brilliant music memory. In addition, gifted children almost always display perfect pitch. It must be added that musicality, as characteristic feature of gifted individuals, is not simply the ability to distinguish pitch, rhythmic patterns, or discern slightest changes of sound volume, but also the capacity to perceive, interpret and express music on an emotional level. Musically gifted children usually show their predilection for music at a very early age. Playing a musical instrument – or engaging in any artistic endeavour, for that matter – requires a level of creativity that many people believe is innate, rather than something that can be learned. As a result, one of the first questions that parents ask me is whether their child has the talent necessary to study music. I believe—and I think most educators would agree—that every child has a certain amount of natural talent that, if nurtured in the right environment, can be developed. However, it is sometimes hard to evaluate the degree of a child’s talent or potential. There are no absolute distinctions between levels of innate musical ability, a subjective matter at best. While some children display astonishing aptitude at a very young age, others may develop at an equally impressive clip with good coaching. Ability in this context is not constant, but rather something that evolves with time and training. •	Genius: An exceptional inborn capacity of intellect, especially in creative and original work e. i. art, music and science. In this chapter, I explore these categories as well as the various conceptions – and misconceptions – about musical talent. As a professional musician and piano teacher for more than thirty years, I have had the opportunity to observe children across a wide range of ages, music experience and levels of commitment. I want to assure parents that all children, without exception, have the potential to learn to play an instrument proficiently, at a level that will allow them to enjoy the experience of making music. In my view, all children have musical ability. Some students demonstrate obvious musical talent while others need the assistance of an enthusiastic, mindful teacher to help them discover and develop their musical potential. Given that most parents are not professional musicians, they are seldom qualified to accurately evaluate their child’s musicality. Help Your Child Excel at the Piano. A Book for Parents. Few people would dispute that music enriches their everyday experience. It evokes memories and stirs emotions; its healing powers are also well known. Whether enjoying a concert, listening to a favourite recording, or playing an instrument, we turn to music as a source of pleasure and inspiration. Music can also play a pivotal role in a child’s development. Numerous studies continue to demonstrate the benefits of an early childhood music education. The research, which has focused on the impact of group music classes as well as private lessons, indicates that children who begin music studies at an early age not only have a greater appreciation and knowledge of music throughout their lives, but also exhibit accelerated cognitive and emotional development. Notwithstanding this conclusive research, parents often find themselves weighing the merit of music classes over other recreational activities. The cost, time commitment and logistics involved in scheduling piano lessons are just a few of the factors that parents tend to think about when looking at their families’ busy and over-scheduled lives. However, as with any decision, it’s important to compare the short-term costs versus the long-term benefits. As a teacher and a perpetual student of music, I urge you to consider some compelling reasons why you might want your child to learn to play the piano.